To protect and increase the population of the blue-throated macaw and other species of the Beni Savanna ecosystem through land acquisition for Barba Azul Nature Reserve. The Crticially Endangered blue-throated macaw is found only in the Beni Savanna of Bolivia, where Barba Azul Nature Reserve constitutes key non-breeding habitat, with counts of up to 155 birds (half of Global population). The reserve also protects the Beni Savanna ecosystem in a natural state, protecting it from human-induced fires and overgrazing by cattle. As many as 1,450 buff-breasted sandpipers (Near Threatened) use the reserve on migration, making this the most important stop-over site in Bolivia. The reserve is also home to 146 mammal species, several found nowhere else in Amazonia, including the pampas deer, maned wolf (Near Threatened), and Beni titi monkey (Endangered). Also present, are the southern tamandua, black howler Monkey, capybara, jaguar and high concentrations of giant anteater. Loss of habitat due to cattle ranching. ICFC contributed to the purchase of a strategic property to double the size of the reserve in 2013. Our field partner is the Bolivian organization Asociación Armonía, which owns and manages Barba Azul Nature Reserve. Asociación Armonía is a Bolivian accredited non-profit conservation organization created in 1993. It is supported by the regional governments of Beni and Santa Cruz and the Bolivian national park administration (SERNAP). In 2009, Armonía received a certificate of commendation from the Bolivian government for its efforts to protect Bolivia's birds and their habitats. Armonía manages twenty conservation programs, including twelve programs with threatened species. Key personnel are conservation program director Tjalle Boorsma, Luis Miguel Barbosa, CEO/development director Bennett Hennessey, and executive director Rodrigo Soria. Hernan Lopez work on reserve protection and cattle management. Carlos Roca and his wife Juri are reserve caretakers and attend to visiting tourists. The Critically Endangered Blue-throated Macaw is found in only one place on Earth: the Beni Savanna in northern Bolivia. Extending over 126,100 sq km, this complex ecosystem of grasslands, marshes, forest islands and gallery forest supports a diverse and distinctive flora and fauna. A comprehensive survey in 2009 found 230 bird species, including many waterbirds and several species of North American migrants. More receently, about 1,450 Buff-breasted Sandpipers (Near Threatened) were counted, making this the most important stop-over site in Bolivia. Of its 146 mammal species (see mammal video, link below), several are found nowhere else in Amazonia, including the Pampas Deer, the Maned Wolf (Near Threatened), and the Beni Titi Monkey (Endangered). Also present are the Southern Tamandua, Black Howler Monkey, Capybara, Jaguar and high concentrations of Giant Anteater. 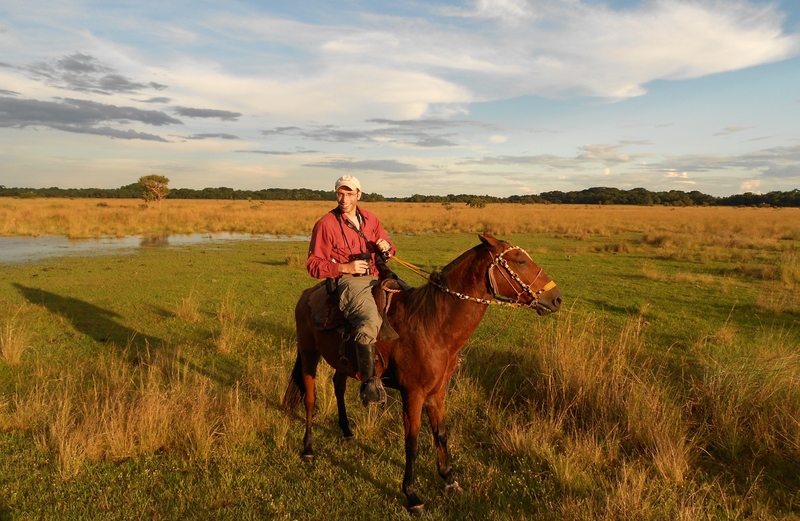 The Beni Savanna is entirely privately owned, mainly by ranchers. Much of it is being degraded by overgrazing, planting of non-native grasses, and aggressive fire management, and each year, more of this habitat is lost to intentional burning for pastureland. The Blue-throated Macaw, whose Spanish name, Barba Azul, means blue beard, was shrouded in mystery until recently. Known from cage birds captured from the wild and from paintings and specimen collections, its range was finally pinned down to the Beni Savanna. There, it depends on palm trees for nesting sites. This macaw species, like many others, faces threats from the illegal pet trade and degradation of its habitat. In particular, the burning of forests kills palm seedlings, resulting in fewer palms for the birds to use for nesting. In 2008, with support from American Bird Conservancy and World Land Trust-US (now Rainforest Trust), the Bolivian conservation organization Asociación Armonía was able to purchase land for the Barba Azul Nature Reserve, creating the first protected area for the Blue-throated Macaw, whose wild population is believed to number only 350 individuals. The impetus for the reserve was the discovery of a thriving colony of at least 80 birds (now numbering about 100), whereas previous surveys had turned up only small groups of 2-3 pairs. The first step was the removal of the majority of cattle from the reserve. When the adjacent Santa Anita ranch came on the market, several conservation organizations including ICFC took advantage of a great opportunity to double the size of the reserve. With almost one third of the population of Blue-throated Macaws, this property is a valuable addition. About 100 Blue-throated Macaws spend 6-8 months on the reserve during the dry season, then disperse elsewhere to nest during the rainy season. Nest boxes erected at the reserve have yet to be adopted by macaws, although other species have used them. However, in the Marban area, Armonia has had success with the nest boxes, which appears to have led to an increase in its population there. We have strong hopes that the macaws will start using nest boxes at Barba Azul, which will be a huge step in placing the species on a more secure footing and reducing extinction risk. 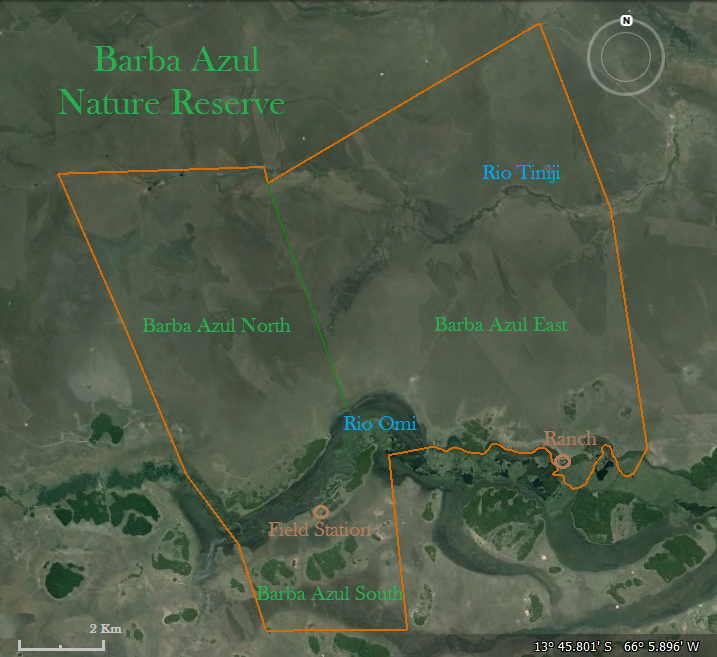 An introduction to Barba Azul Reserve and its wildlife. This video explains the importance of the Motacu Palm Tree to the Blue-throated Macaw and the many mammals of the Barba Azul Nature Reserve that depend on its abundant fruit. The purchase of the 6,358 ha Santa Anita ranch was completed in 2013, bringing the total reserve to just over 11,000 hectares. Other contributors, in addition to the Rainforest Trust (a lead supporter of the reserve) and ICFC were: American Bird Conservancy, Patricia and David Davidson, IUCN National Committee of the Netherlands (supported by the Dutch Postcode Lottery), Loro Parque Fundación, Neotropical Migratory Bird Conservation Act program of the U.S. Fish and Wildlife Service, Robert Wilson Charitable Trust, and the World Land Trust. ICFC is confident in the ability of Asociación Armonía to protect and manage the reserve. ICFC maintains the ability to defend the permanent conservation use of the acquired land to which we contributed through use of a mortgage on the land aimed at that purpose.